There is, in each of us, an idea of self. A vision of who we are, what we stand for and what we're capable of accomplishing. Like the perfectionist painter, this idea is the canvas in our closets that we continue to modify and hopefully, improve. I'm of the belief that this idea of self is always in flux. 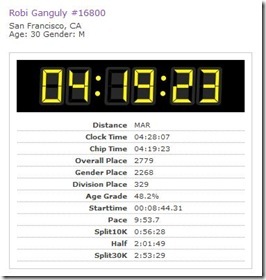 This last weekend, I ran my first marathon and changed a piece of my self in a meaningful way. This post is about examining my conception of self and one of the tactics that I apply to create change in my life. Shortly before my 10th birthday, I started taking Tae Kwon Do (TKD). From day one I was hooked. Being shorter or smaller didn't matter. I was fast, I learned quickly, I liked to fight. I was good at it, immediately. A few months later, my family adopted a cat. Aside from fish, I'd never really had a pet and taking that cat in really opened my eyes to how attached one can get to an animal. We named her Aintabelle (the opposite of Isabelle..super dorky) and I quickly became her favorite. As coincidence would have it, I have pretty severe pet allergies. We didn't really know it at the time, but when we took in the cat, I inflamed the asthma that was latent in my lungs. So there I was, 10 years old, passionate about this new sport I'd started, in love with a new cat friend we'd adopted and wheezing. A LOT. Life seemed really unfair to me at the time. Despite the asthma, I managed to keep practicing TKD. I loved it so much that I fought through the asthma. It'd flare up, but I managed it. At home, as we figured the allergies out, I had to stop playing with the cat so much (it was hard, I'd usually just stop when my eyes got too red..) and she couldn't go in my room at all. It wasn't perfect, but combined with the inhalers, the allergy meds and the modified diet my parents put together for the cat, we kept it going all throughout my teens. The thing was, I had asthma. It was allergy-induced and although exercise exacerbated it, I could make it through in certain situations. I loved TKD so much (perhaps because I'd tried it before having to deal with asthma-attack laden lungs) that I figured out a way to get through. I got stronger and stronger every class and it actually made me more fit. I had to work 20% harder than everyone else, but I didn't care. It meant that I had more gas in the tank when I was finishing matches (my specialty became winning in the final round). I did what I had to do, because I wanted it, just that badly. PE and school sports however, were another matter. When cross-country and track and field came around, I tried to compete, like I did for all of our sports. I ran a bit but didn't really enjoy it. It was torture, running while having lungs that were not terribly efficient and seeing other kids go so much faster with much less work. It demoralized me. At school I became the kid with asthma, who couldn't run when you had to run in PE or who would, but was slow and had the inhaler. That was me. From time to time, I'd feel great and run well, but most of the time, I was slow, it was painful and I hated it. Meanwhile, at TKD I was a different person entirely. I matured, I competed, I did well and it was a virtuous cycle of reinforcement. Day after day, month after month, I developed an idea of who I was in my TKD uniform: I was a competitor, a winner, an instructor, a coach. A leader. More than anything, Tae Kwon Do taught me how to lead when I was a teenager.. it was incredible. The way in which I saw the world, the opportunities available to me, the possibilities in life.. all of the options in my head became affected by a physical affliction. I got it in my head that I wanted to be good at TKD. That I could prove myself through it - that martial arts, unlike other sports, were a place where the fact that I was smaller, smarter and not white didn't matter. They might even be assets. My frame of reference, at TKD, gave me the ability to envision great success, despite asthma. I decided that I could and would be good at TKD and with hard work and practice, I was right. As I met with more success in TKD, a disturbing pattern began to emerge. I'd prepare myself for the competitions and then, day of, I was often less interested in winning the competition than just getting it over with. Many times, I only really invested myself in winning when I thought I had something to prove to others. There was the match where the kid was double my size (no joke - I weighed 50+lbs, he weighed 98 lbs), or the numerous times when I sparred the adults in class and I'd destroy them for taking it easy on me. More often than not, I was motivated to prove others wrong. - The first occurred when I was preparing for the state championships my senior year of high school. I was at this point, the favorite. I'd won the past 3 or 4 years and I'd actually competed nationally a number of times. It was a strange feeling, being the favorite. I took training easier. I didn't push myself to fight the bigger, tougher opponents in my classes. My friend Rocky had argued with me, saying that if I forced myself to run, I'd be in even better shape and would be able to not just finish the fights strong, but to finish the tournament strong. Fighting 4 or 5 9-minute bouts was devastatingly tiring. He was right. I didn't care. I ran once and stopped. - The second occurred at the high school graduation party my parents threw me. My master came to the party. At this point, he'd been part of my life for 9 years. I was his 3rd student. He cared for me quite a bit. He made me who I am, in some ways. He talked with my parents about the fact that he was disappointed that I was leaving the state and couldn't continue to train with him for Nationals and the Olympic Games. I heard about this later from my parents and the overriding thought in my head was, "That sounds like too much work." I'd looked to prove other people wrong with TKD in the first place and followed that pattern by looking to others for motivation to get better at TKD. Progress, after a while, became a series of spurts, rather than steadily occurring change. I've learned that this approach doesn't tend to work well in the long run. We have to create and maintain the habits that define us. It requires continuous investment and repetition, that's why it is, in fact, habitual. My habits take work, regularly. So, one of the habits that I care a great deal about is that of self-motivation. When no one has expectations of you or they already think that you're doing well, you can often coast and make excuses if you don't live up to expectations. The reality of the world that I live in is that it doesn't take a tremendous amount of work to just tread water. In personal and professional life, being average to above-average doesn't seem to be challenging. Of course, this is contextual, so I understand that I exist in a privileged class. I might rephrase this and say: coasting, in life, appears to be the norm. I don't think that this is terrible. It does, however, explain why I'm more likely to give you feedback and try to offer praise. I have had to learn that I can't rely upon you for motivation. Over the past several years, I've taken up running. It started off slowly - 10 and 15 minutes on the treadmill at the gym. Jogging really slowly with friends. Introducing myself to the idea of enjoying running, not hating it. 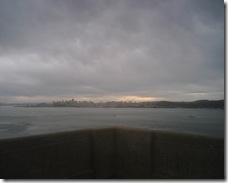 I found something amazing happened once I started running outside in San Francisco: I got happier. It really was as simple as that. 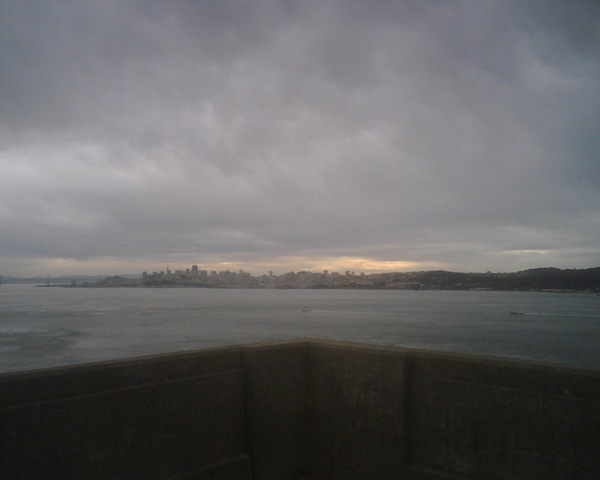 One day I started running down to the Marina and along the water and after that I couldn't stop. It's just that beautiful, calming and energizing for me. I've always loved the water and running along it made me appreciate running and San Francisco far more than ever before. As I ran, I got healthier, I got happier and I taught myself self-motivation. At first, when I started running regularly, I found myself looking at how others were doing in order to find a reason to push myself a little harder. I was falling back on the habits I'd developed in TKD. But I realized it and sought to change it. Now, when I run, I play mind games with myself. Sometimes I see someone running faster and see if I can keep up with them to test if I'm taking it too easily. I see how much of a song I can make it through at a dead sprint at the end of my run (I was up to half a song or ~2 1/2 mins). In short, I learned to focus inside for my running motivation and increased performance. I made myself start running the bridge, to see if I could do it. 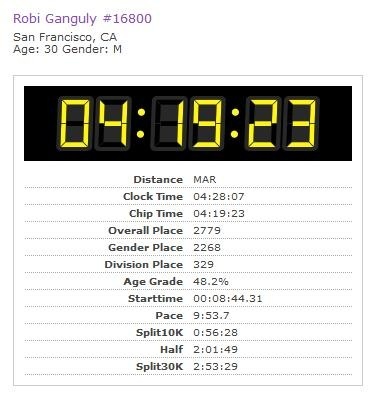 I took the US Half Marathon course map and did it, the day before the race, to see if I could do it. 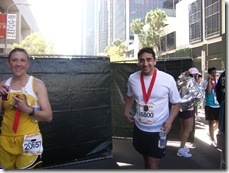 I started training with Allison for the LA marathon, to see if I could get my mileage up quickly. 3 weeks after Allison said that she was going to do the marathon, I knew I was in. I wanted to see if I could prove that my past self could be changed. 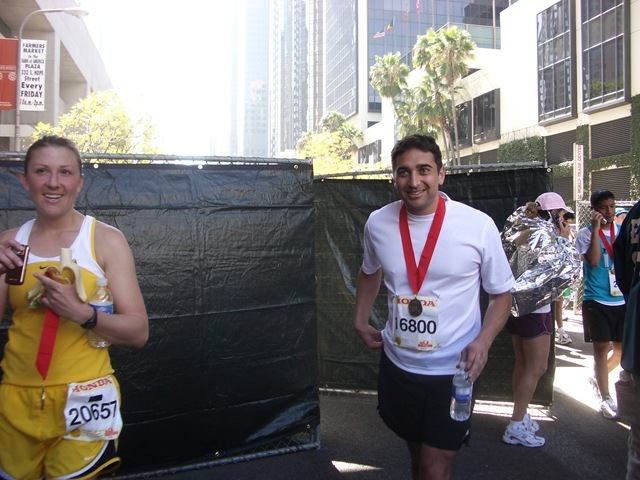 I wanted to see if I could grow far beyond the asthma attacks of my youth to complete a marathon. Which brings me back to the title of this post, "Proving your self wrong". As much as it was important for me to build myself up and enter the race, feeling as if I could do the marathon, that's not the whole story. Many of us know and believe that being positive is a great thing, that it helps us push forward in life. But many of us forget that along the way, we reach points where we feel as if we CAN'T do anything. In those moments, many of us vow to avoid those can't determinations again. We don't push through. "Mile 20. I can do this. I can do this." I wasn't going to be able to finish. And so, what I want people to remember is that sometimes, it's not that you're lacking a positive outlook. It's that you need to prove yourself wrong. If you want something out of life but think you've objectively determined that you can't have it... you're probably right. Go test yourself. Your self just might change. Congrats buddy - this is no small feat! For the record, yes, you were a small kid ... but I honestly believe that everyone knew there was fire inside you to ascend. Phsically, mentally - all of it. You continue to prove us right - congrats bro. great story. thanks for sharing it. funny, we both were small and took to proving ourselves growing up through sport. it's interesting to think about how relationships with our fathers factor into that whole equation...this inner desire to identify as a "man", and define that in some way. just a random thought. Thanks Jim. I don't know if everyone knew it, but I've known you always had my back, thanks buddy :). Mark - deep commentary. Will have to follow up with you offline, but I do find it fascinating that we both used sport to prove ourselves. I think there's a lot there in your note about relationships with our fathers, I'd like to explore that more.